It's always so damn convenient na to say something, or do something and then blame that on mood swings? Well, almost all of us do that, especially females. But I do not blame them. We have so many things going on in our minds, a long "to do" list each morning, almost all the time we suffer from under-performance (I would call it lack of time) as we cannot master each and everything. Things we cannot manage, or certain things we say, they are usually due to the mood swings that we get all the time. Second person is Shilpa. Again, with her it is on and off chatting about small small things we suddenly remember, or if I want any advice about anything, or a farmville gifts neighbours she wants (I quit it yet again!) and such. We speak for 5-10 minutes each time and that happens around 10-15 times a day :P So, no short attention span problem here too. But the short attention span does come. I usually take a break from work a bit late at night and work usually through the night. I can work that way better. A few friends staying abroad are online at this time. When I talk to them, I do not multi-task purposely just to get a small break from work. But I cannot expect the same thing from them. If their reply to me is delayed even for more than a few seconds, I lose patience. I start looking here and there, I will start eating something, or play around with laptop and they feel that I am not paying attention to what they are saying! Ab main kya bolu!! Isn't this image super hilarious? At least I found it too funny. Anyway, coming back to my mood swings, I get in a blabbering mood too. I will jump from one random topic to another one and there will not be any connection between the two. God can also not save you if you do not get what I am saying. You cannot ask - what are you talking about. Ah, here "you" means my close friends who know me well :P With others, I usually pretend to be normal. And those who say that mood swings are only girl thingi, contact me. I will introduce you to a few friends who are kings of mood swings. But more on them, later. mood swings are with most of us but the only subject is who thinks about it with focus And who is not thinking. Mood swings are temporary - some obvious, some frequent, some uncontrollable...And like you said, it gets obvious, frequent or uncontrollable perhaps with people who are close to you. mood swings are just due to bunch of brain chemicals. I have terrible mood swings. I myself dont know why that happens but i vary to extremes. Btw, how come we never chat? Mood swings are due to fast paced life, higher work pressures, lower patience levels and modern lifestyle. And we can say 'Yes' to all of them. Aromatherapy with oils like chamomile, jasmine and rose can help in mood swings. Quite a few ppl hav mood swings...its difficult for others to understand why the person is behaving in that manner and can cause a bit of problem in the relationship!! 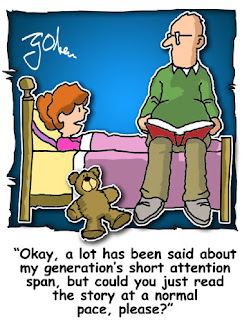 A post to defend your short attention span? LMAO!! Cmmon, face it, you have a short attention span, in WATEVER mood you are in. Dont write about how everyone blames things on mood swings and then go ahead and blame this one on mood swings. Look at yourself, in whatever you do you, you have SUCH a short attention span! @ Appu, hmmm, interesting point..
@ Wise Donkey, welcome here..oopsie, brain chemical? that confirms the fact that I indeed have some brain..with me, it depends on my mood..I can talk for hours on crappiest topic and quiet on the most interesting one.. Mood swings are very normal.Swings could be due to various reasons including work related stress and the environment at home.They say one could also have changing mood swings depending upon the tide---high tide or low tide.But, irrespective of all this, what is more important is how does one handle the swings. ya Mood swings are part of us..and it's ok yar..once v know someone is not in good mood, it's better v keep off for the moment and talk when s/he is better..
Neha! You are extremely articulate! Made a wonderful reading!! Mood swings are common. You have realised like you have about short attention spans. Its all about the discovery. Be as you want. SO what? Mood swings are ok once in a while. It's difficult handling people who have a different mood every 5 mins! All said and done, we all are humans. You never know what triggers your mood to swing. Moodswings are a woman's birthright and we shall have them. 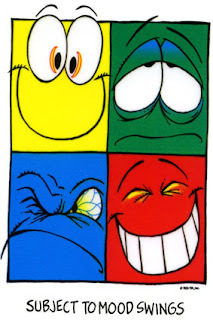 Mood Swings is like a 'Weather'..highly unpredictable.. count me as one of the mood swingers. @ Bik, time nai hai na wo sab karne ka..well, nobody can understand women..even men for that metter..